Sexual maturity: females at 6-7 years old and males at 5-12 years old. Mating season: Spring and autumn. All year round in the tropics. Birth rate: one calf per year. Dive depth: 70 metres, maximum 300 metres. Maximum speed: 60 Km. /h. Teeth: 80-120 small conical teeth in each jaw. Unknown. In our area it is becoming a difficult species to find. Their sighting levels are lower than the pilot whale and the striped dolphin. In the Pacific (due to tuna fishing) and in the Black Sea (where, alone, accidental catches exceeded 100,000 in 1998) they have a high mortality rate. This is a matter which needs to be sorted out because many animals die needlessly each year. The area in front of the flanks is yellow-coloured. Its nose is longer than a striped dolphin’s. White belly and dark back. Black dorsal fins although some individuals show whitish colouration. All the seas in the world in tropical and temperate waters. In this area, it lives in open, deep waters (normally between 1,000 and 2,000 metres). It is a highly active, gregarious species, forming schools of between 10 and several thousand, generally in deep waters. The size of the school depends on what they are doing (hunting or resting) and the presence of prey. 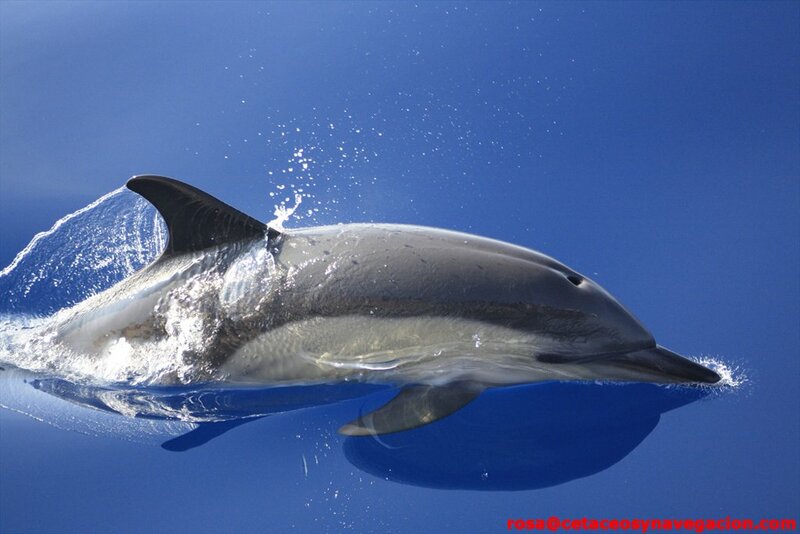 They are often seen with striped dolphins. They are fast swimmers and usually do acrobatic leaps, hitting the surface with their head and body. They are curious and usually swim close to boats, from where you can hear their whistles and sounds.